Use the following six-step process to gain Poolmark accreditation for your facility. Scroll down on this page to read more about each stage of the process. The Code ensures that the technical operation of a pool meets quality standards that provide a healthy experience for swimmers using recognised and established practices, techniques, engineering and design. For this reason all UK pools are encouraged to follow it. Swimming Pool Water is the essential guide for everyone involved in the design, treatment, management and scrutiny of pools of all sorts – expanded, refined, updated, still authoritative. For this reason all UK pools are encouraged to purchase it and follow it. PWTAG Technical Notes are updates or new material for the standards and guidance given in the the PWTAG book, Swimming Pool Water and the PWTAG Code of Practice and should be read in association with these publications. 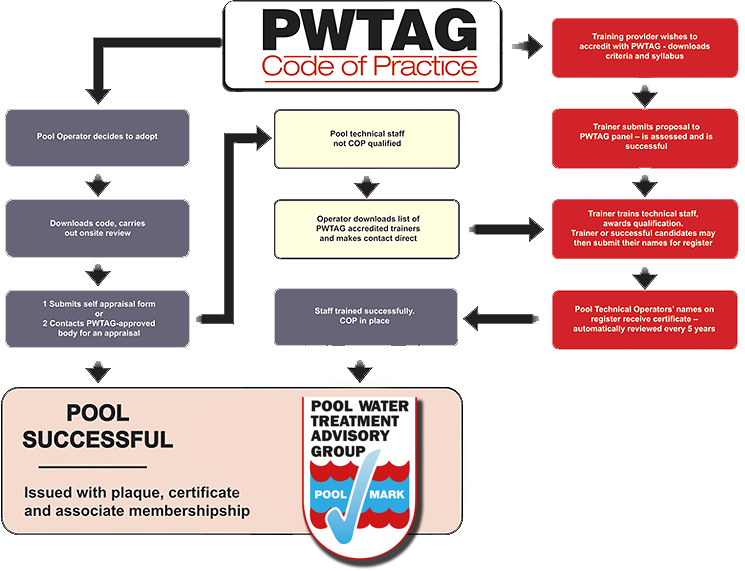 PWTAG keeps pool operators up to date by providing guidance through these technical notes on the issues of the day. We specialise in applying objective study to help optimise swimming pool technical operation. To meet the Code and gain the Poolmark qualification pools must have appropriately trained and qualified staff called swimming pool technical operators (SPTOs). To show the training required PWTAG has produced a training document. Its syllabus defines the knowledge and onsite skills that lead to competence. Pools themselves can assess staff knowledge against the syllabus, or it can be used as the basis of a training programme. PWTAG itself does not do the training: that is done by the accredited training organisations. (see registered operators) But staff who go through a PWTAG accredited training programme have the assurance that their staff are trained and qualified to PWTAG standards. Our self-assessment form is a good way of checking whether your pool is satisfying the requirements of Poolmark accreditation. Not relevant: this question is not relevant for your pool. The self-assessment form is under construction and will be available again soon. Once you are satisfied you are ready for a professional assessment, contact us on admin@pwtag.org to arrange for this to take place.